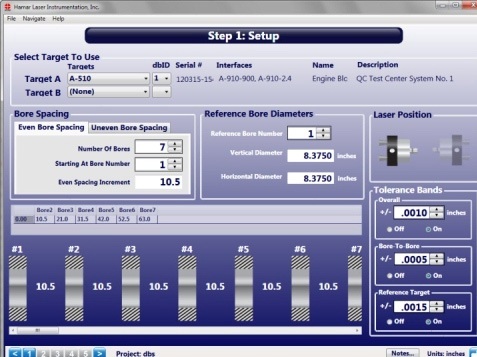 Hamar Laser’s new Bore9 software supports all of Hamar's past and present bore alignment equipment to create a powerful tool for measuring and aligning multiple bores. This comprehensive and easy-to-use program measures bore straightness (axis centering) and diameter change when using our targets in measuring mode. Bore9 guides the user through the alignment with a 5-step process, starting with Step 1-- Bore Setup and ending with Step 5-- Results. Results can be plotted, saved and also exported into an Excel spreadsheet for further analysis. Straightness data from up to 50 bores can be recorded. 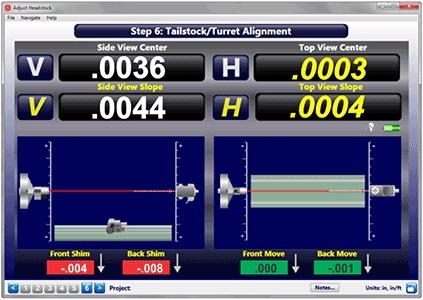 The alignment displays the update with each adjustment, allowing the user to quickly correct misalignment errors. Live target readings are displayed on the plot screen. Bore alignment is accomplished by bucking in the laser (making it parallel) to the end bores, and then moving the target from bore to bore to measure deviations from the end bores. By using the NORMIN error correction procedure, both the alignment of the bores and the diameter changes are calculated automatically. All that is needed in an accurate diameter measurement of one of the reference bores. Plot data can be changed to reflect the position of the centerline of the bores relative to the end bores, selected bore numbers, the laser beam or a “Best Fit” line. The data for each point is recalculated automatically based upon which references are chosen. 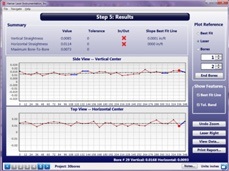 Reports display the recalculated data and overall and bore-to-bore tolerances. 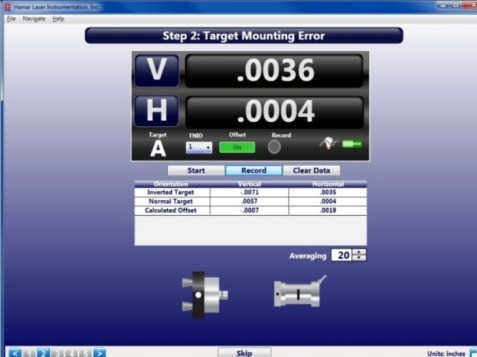 Step 2--Target Mounting Error allows the user to follow our simple NORMIN procedure, removing centering errors in the target and bore adapters to give the ultimate in bore alignment accuracy. Additional features include the ability to zoom in and out of the graph area, to change direction when recording data, to select the target orientation when performing the NORMIN procedure and to automatically move from one point to be measured to the next. Reports can be customized to the four different bore references, comments may be added, and the report can be printed with a summary, a graph of the vertical and horizontal straightness, comments and a table showing the recorded data. 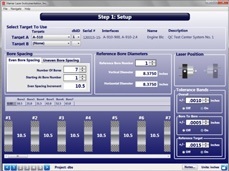 The Bore9 Setup Screen prompts for the target(s) to use, the number of targets, even or uneven bore spacing, the number of points to be measured, the reference bore diameter, the laser position and tolerance bands (overall, bore-to-bore and reference target). 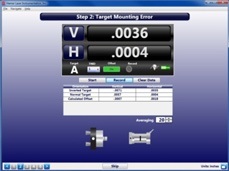 The Target Mounting Error Screen uses NORMIN procedure to determine mounting errors in the target and bore adapter and automatically adjusts the display to remove the error from the readings. The user will be required to take 2 data points: 1) with the target in the NORMal position; and 2) with the target in the INverted position. The software calculates the mounting error and then applies it to the displayed and recorded data to remove the mounting error from all data points. This is a global target offset and is applied to all data, but it can be toggled on and off as needed. 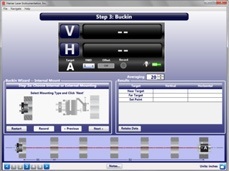 Buckin (laser setup) calculates set points for making a laser parallel to two reference points, usually the end bores. The Buckin Wizard guides you through the Buckin process for both internally mounted lasers (such as the L-708 Laser with the A-514 Self-Centering Adapters or any laser mounted directly in a spindle) and externally mounted lasers (such as the L-705/L-706/L-708 with the L-111 Laser Stand and L-102 Beam Translator). 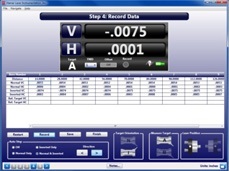 The Record Data screen provides three icons that display the alignment setup: Target Orientation (NORmal or Inverted), the Measure Target selected (A or B) and the position of the laser (left or right). Data may be recorded with Auto Step, which automatically advances the cursor to the next data point to be recorded. 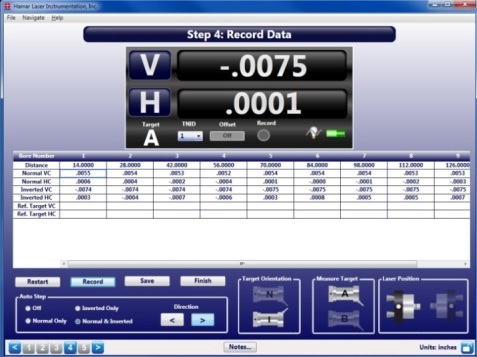 To record data, the user selects the desired Auto Step method and inserts the target/adapter into the first bore. He then clicks Record or presses the spacebar to record the data point. The target/adapter is moved into the second bore and the recording process is repeated until all data has been taken. Best Fit – Shows the misalignment of the bores relative to the Best-Fit line rather than to the laser beam. To calculate the Best-Fit line, a least-squares, best-fit algorithm is used to find a line that “best fits” the raw data. It is especially useful because it removes any excess error in the data from the laser beam not being perfectly aligned to the end bores. It also makes the laser setup faster since the laser beam does not have to be exactly centered in the bore to get accurate straightness measurements. Laser – Shows the misalignment of the bores relative to the laser beam. A dashed black line indicates the Best-Fit line. Bore Numbers Shows the misalignment of the bores relative to the selected bore numbers. This view makes the designated bore numbers the zero point and plots the positions of the remaining bores in relation to selected bore numbers. It also shows the Best-Fit Line of how much overall slope there is in the bore data relative to the selected bores. Hovering the mouse cursor over any data point displays the data for that point. A red square on the graph indicates which point is selected and the data displays in the lower right corner of the plot area.